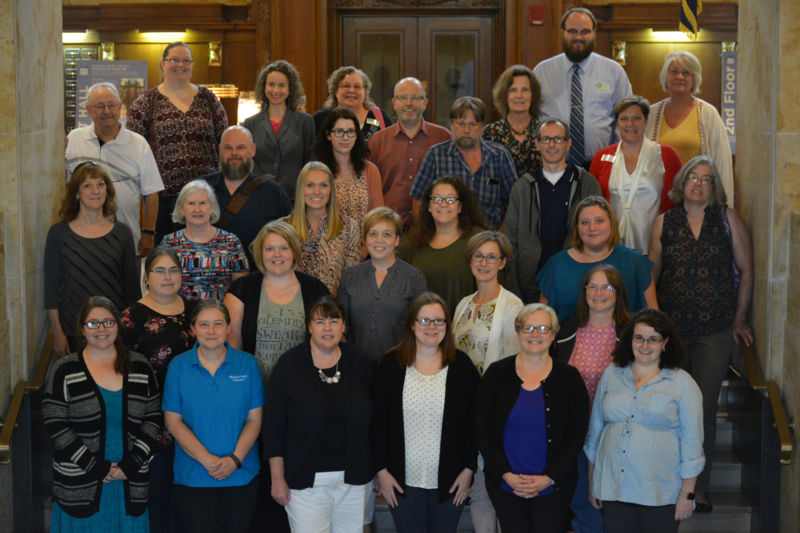 On Aug. 15, 2018, at the Indiana State Library, 32 new public library directors, representing 24 counties in Indiana, were introduced to each other and to the Library Directors One-Stop Guide. Public library consultants Karen Ainslie and Angela Fox hosted the annual New Director Workshop and presented on multiple topics. The workshop offered an orientation to the many resources of the guidebook, including contacts for public library directors. The guidebook’s 20 chapters inform directors on the many tasks and responsibilities necessary for the day-to-day management of public libraries. The opening presentation focused on the distinct roles of the director versus the board, including standards, library laws, certification and professional development. Additional presentations covered sharing resources, the INSPIRE database and other digital resources. The morning activities concluded with a walking tour of the Indiana State Library. In the afternoon, directors heard about the roles that the Department of Local Government Finance and State Board of Accounts play in the budget and financing of public libraries. A survey of grants was followed by a session on public purchasing and public works to familiarize directors with the bid process and obtaining quotes. Also included was an overview of the children’s services provided by the Indiana State Library. The day concluded with a group picture taken near the Great Hall. This blog post was written by Karen Ainslie and Angela Fox, public library consultants, Indiana State Library.